For Updates, Please Visit My New Site, www.1nationstyle.com! Exciting news! I finally took the leap and bought my own domain name and designed a more professional site! In order to stay up to date on all of my projects and my fashion tips, please head over to www.1nationstyle.com. Thank you all for your support and comments over the years, it has made all of this possible for me! Is Being Cheap Making You Broke? It seems like the world of fashion is moving faster and faster. Trends come and go in the time it takes to post your outfit on instagram. Retailers like H&M and Forever 21 are cashing in on this in a big way, driving demand by constantly restocking their stores with new and insanely cheap merchandise. People think nothing of picking up a trendy top for $10, especially since that trend may be over before you even get the tags off. But what if our habit of buying cheap is costing us big? 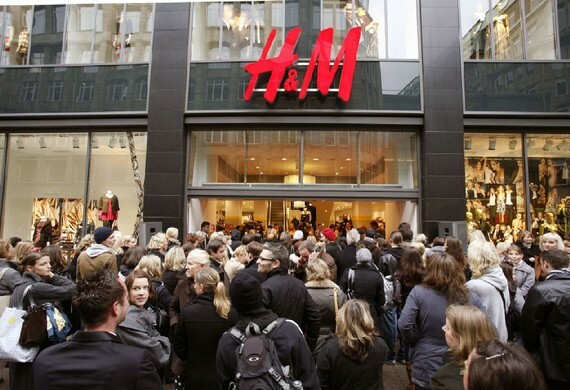 Consider this: last year, H&M’s gross sales totaled $22,799,000,000. I had to triple check that figure because I couldn’t believe it. Globally, we spent almost $23 billion at H&M alone. That’s like every person on earth spending $3.29 at an H&M store. considering they are actually selling a women’s tank top for $2.95, that is a scarily realistic figure. We all bought that tank top last year. And more. Have you ever considered what happens after we buy that tank top? We wear it, then forget it. Let’s face it, in the heat of the moment, you just couldn’t pass up such a crazy bargain. You weren’t even looking for a tank top, but it cost less than your morning latte, so what’s the harm? You’ll wear it eventually, right? Probably not. It’s actually pretty hideous. Too short and too wide, this trend looks good on like maybe three people and you aren’t one of them. You might wear it once, but sooner or later it gets pushed to the back of your closet with the rest of your regrettable fashion choices. Years from now you’ll dig it out and laugh at yourself. Until then it’s just taking up room. It wears out, quickly. Let’s say you find something you actually really like. How many times do you get to wear it before it falls apart? When you’re making a garment to sell at such a low price point, quality goes out the window. They use the cheapest fabric available, the cheapest dyes, and the cheapest labor. Once laundered, your garment will never be the same again. The fabric will shrink and pill, the seams will pucker, and the dye will start to fade quickly. Basically, you can wear it once and have it look respectable. You head back out to buy some more. So that top fell apart after a few washes? No worries, you can go pick up another one! If you can find it. Even if it has only been a few days, the entire geography of the store has likely changed. And the item your looking for might not even be there anymore. Fast fashion retailers restock and reorganize their stores continuously in order to keep their customers shopping longer. Because the longer you stay in their store, the more money you spend. All of this adds up. If you buy a $5 shirt that last through three washes, you’ll be buying another $5 shirt within a month. And then another. And another. In fact, you will spend about $86.67 in one year just buying and re-buying the same ill-fitting shirt. If you add in the gas money you’re burning through on each trip, it gets even more ridiculous. Let’s assume a 15 mile round trip each time. In 2013, the average passenger car in the US got 23.4 miles per gallon. With 17.33 trips per year (every three weeks), you drove 260 miles and burned up 11.11 gallons of fuel. In 2013, gas cost an average of $3.49, so you spent $38.78. So one year with that $5 top actually cost you $125.45. Still think it’s a bargain? This tank from Vince ($48) was built to last. And it is supremely soft, as well. Buy one quality piece of clothing in a classic style and flattering cut twice a year. Retailers have their biggest sales in January and July, so if you don’t mind buying mid-season, you can save a bundle. Beware of outlet stores. Nowadays most of the goods in the outlet store were never on the shelf at the full-price store. Companies are taking advantage of bargain hunters by manufacturing cheaper clothes just for their outlets. Also, most sale items go through three markdowns (usually 30% off, 50% off, then 70% off) before being shipped to the outlet. At the outlet, they are marked back up to the first mark down price! You could have saved time, money, and gas by shopping at the closer retail store at the right time. Sign up for emails from a few of your favorite brands and they will tell you when they are having a sale. Before you go shopping, take a look through your closet. Being reminded of what you have will make you less likely to purchase duplicate items. For me, it also serves as a reminder that my closet space is at a premium, so if I’m going to cram anything else in, it had better be something extraordinary. Take a good look at your clothes before you buy them. Make sure they fit well and flatter your body type. Think about the style. Is it something you would have worn a year ago? How about five years ago? This piece is going to last, so make sure it won’t look dated in a couple of years. Now take your clothes off and look at them. Are the seams well made? Is the fabric thick enough? If there are embellishments (beads, sequins, etc.) how well are they sewn on? If there is a zipper, how easy is it to pull? Is it sewn in securely? Zippers are usually the first thing to go wrong on a cheap outfit, so spend some time testing it out. On more expensive items like suits, coats, slacks and dresses, a great indicator of quality are the insides. Seams should be pressed and there should be extra fabric on them. This allows items to be tailored to fit you better (which you should absolutely do) and prevents unraveling. Take a look at the label. Where was it made, and what is the fabric made out of? These are giant indicators of quality. Third world countries like Bangladesh are the cheapest to manufacture clothing in, so you know they didn’t put much money into labor. Blended fabrics are often cheaper, so watch out for materials like rayon and polyester, they are probably only there to drive down the price. Avoid colors that won’t last. Let’s face it, a white suit coat is not a great investment item. If you don’t ruin it, your dry cleaner will. Likewise, red dye is typically the least color-fast, meaning that it fades quickly and often stains your other clothes in the wash as well. You don’t have to avoid red and white altogether, but be aware of the extra work that goes into keeping them looking new. Care for your clothes properly. The number one cause of damage is heat, usually from the dryer. Hang dry your clothes whenever possible as this will greatly reduce the damage done during the cleaning process. Also, separate your knits and other delicates from items that might snag them. Anything with a zipper (especially jeans) or hook and eye closures (bras) should either be washed separately, or placed in a mesh lingerie bag prior to being put in. This will keep them from snagging your clothes and will extend their life. Ask yourself: does this item bring me joy? So often I hear clients tell me that they ended up buying something “just to get out of there,” as if they needed to justify the time they spent shopping with a purchase, any purchase. Likewise, buying something because it is good enough only empties your wallet and clutters your closet. You do not love it, you do not need it. Hold out for something truly amazing. By utilizing these ten points, you can effect dramatic change in your life. You will have more money, better clothes, more room in your closet, and more joy in your life. Stop throwing your money away on disposable things and start investing in lasting happiness. I created this set for my friend Emily, who wants to channel a bit more of a Gwyneth Paltrow vibe. These are just a few ideas to get started. I tried not to go too crazy with price point, but I do firmly believe in buying top quality accessories, especially when it comes to shoes and purses. I hate cheap, uncomfortable shoes that fall apart after one season. Quality footwear will last for years and years, and handbags should last even longer, especially if you take good care of them. Get email updates from me!